Green Day has one of the most visual shows on the planet. Billie Joe is never standing in the same place for more than three seconds. When you're racing across the stage, double picking to St. Jimmy isn’t always practical. Luckily, Green Day has an astounding crew in the background to let the wild and crazy stage antics continue. Jason Freese is a popular man in the rock world. He is a part-time member of the Vandals, he toured with the Goo Goo Dolls on the Gutterflower tour, and he also toured with Weezer on the Make Believe tour just to name a few. His brother, Josh Freese, is the drummer for the Vandals, Devo, and plays with A Perfect Circle as well. Jason can be found at any Green Day show playing saxophone, piano, trombone, and, according to Billie Joe, many pornographic websites across the Internet. Jason's wife Amy works with children and he has played at her school for kids before, corrupting the youth, younger and younger. Jason Jeremy Freese was born on January 12th, 1975 and has been wicked awesome and musical from day one. 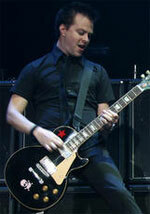 Mike Pelino is a newer member to the Green Day team, but he is anything but new in the music industry. He joined a band out of high school and signed with the infamous Lookout! Records. (They have also recorded with SPAM, New Disorder, and Adeline.) His incredible band, the Enemies, is an amazing punk band that has released two albums titled Pitch Black and Seize the Day. They were also talented enough to be featured on Lookout! Freak Out volumes one and two, and how could they not be? They have a lot of similarities to an early Green Day sound. The Enemies have mastered the aggressive eight-note bass line and Mike rocks out on distorted power chords. Evidently, all of us obsessive Green Day freaks on GSB are not the only ones addicted to Green Day. The original plan was for Mike to play back-up guitar for two months, but obviously he stuck around to help finish the tour. In addition to helping Green Day and playing with the Enemies, Mike has his hands full across the world in Shanghai, China! He is creating one of the first music and radio stations the republic will have, along with the help of his wonderful girlfriend. With so much action going on, it's no surprise Mike's a busy person. When I messaged The Enemies on MySpace and asked if they had pointers or tips for my article, Mike's sister Arica was extremely helpful and nice and forwarded Mike the message. We haven't gotten a reply yet, but he must be beyond busy, I can't imagine how much work and effort it takes to start a radio station. Gabrial McNair was also another person to offer a helping hand and assisted Green Day with not only touring but recording on the Nimrod album. Gabe was born on September 8th, 1973. He plays multiple instruments including trombone, saxophone, guitar and was a drum major at Glendora High School. Once he graduated from high school he continued to study music at Citrus Community College where he majored in jazz and classical music study. After attending that college he advanced his studies even more when he began going to the California Institute of the Arts. Currently he has his own band called Oslo. Oslo toured with Blue October in the fall of 2006. Gabe has also been involved with Gwen Stefani since her days in No Doubt back in 1993. Even now that she is a solo artist, he continues to work with her. Gwen's Harajuku Lovers Tour in 2005 involved Gabe. On a lighter note, Ronnie Blake is featured on several songs, including King for a Day, on trumpet and percussion. Ronnie Blake has taken the art of secrecy to a whole new level. I have decided there are two possible theories: A - Ronnie Blake is from another planet and was sent here to spy on the entire world, eventually taking it over, or B - He doesn't like being in the lime light and keeps a low profile. As fun as option A could be, I'm thinking B is more logical. Regardless of his personal information, he makes great contributions to all Green Day shows he has played at and is an outstanding musician, just like every member (or back-up member) of Green Day.